Hi! My name is Kishan Chand. I am mentally challenged. I need help to perform basic tasks. I need love and attention. My needs are not special. Hi! My name is Basharat. I have permanent paralysis. I need help to move around. I need a shelter. My needs are not special. Hi! My name is Anil. I am bedridden. I need medical care. I need a reason to live. My needs are not special. Hi! My name is Kiran. I have no control over my limbs. I need support to perform tasks. I need love and affection. My needs are not special. We are 85 residents of the Delhi unit of Cheshire Homes India. We don’t have a sound mind & body. We don’t have a family. Yet, we have hope! Why disability is worth a thought? People with disabilities are among the most marginalised groups in the world. Such people have poorer health outcomes, lower education achievements, less economic participation and higher rates of poverty than people without disabilities. Society fails to accept and accommodate all its members. People with impairments are disabled by society in the sense that they are deprived of their rights and opportunities. These barriers can be overcome, if governments, non-governmental organisations, professionals and people with disabilities and their families work together. 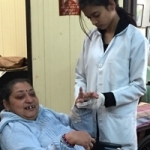 Cheshire Home India- Delhi Unit is one such organisation that works towards changing the mindset of society and providing a sense of equality to people with disabilities by promoting mainstreaming and inclusion. Make your gift and make them smile today. Thank you very much for the invite I would have remained unaware of the excellent work that is being carried out here with dedication and devotion. Please keep it up. And if we can be of some help do let me know. It is rare to inspiration at a place which is supposed to be without hope but I return today inspired, humbled, energised to do more for those who don’t even or can’t even ask for help. It was a beautiful experience, please continue this wonderful service to the society and make this world a better place. It is wonderful being at the Delhi Cheshire Home. I am very impressed by the improvement in the facility and the individual care given to the residents. Congratulation and Best wishes. It is one of the finest movements to be among the happiest people on this earth. I hope and pray that we take a lesson from the inhabitants of this great institution. My complements and best wishes to Mrs Mira Pradeep Singh and all the trustees and the team. I was so impressed with the entire happy faces saw. Your residents are obviously extremely content with all the loving and imaginative care you all provide.